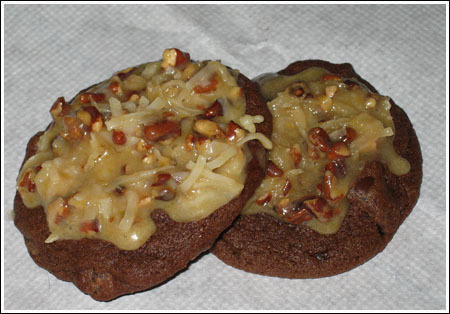 I found this recipe for German Chocolate Brownie Cookies on Recipezaar and daringly tried it even though it hadn’t been reviewed. I’m going to be the first to review it and I believe it will get 4 stars because it lives up to expectations and is attractive. These cookies don’t contain any German’s chocolate but they do have what I think is the best part of German chocolate cake, the evaporated milk/coconut/pecan/ frosting. I made a half batch of these and produced 10 cookies, so thefull recipe (as written below) will probably yield 20-24, depending on how generous you are with your scooping. The icing was very simple to make, and thickened up very quickly – in less than a minute. Then again, I made half batch, so there wasn’t much in the pan. Preheat oven to 375 degrees F. Combine cocoa, flour, salt and baking soda; mix well and set aside. Cream together brown sugar, shortening, water and vanilla until light and fluffy. Add eggs and continue beating for 2 minutes. Stir in flour mixture until well mixed, then add chocolate chips. Drop by tablespoons onto ungreased baking sheets and bake for 7-9 minutes. Do not over bake. Cool for 2 minutes on baking sheet then transfer cookies to wire rack. Prepare frosting. Combine evaporated milk, sugar, butter and egg yolks in a medium saucepan. Turn heat to medium and cook, stirring often, until thickened. Remove from heat and stir in vanilla, pecans and coconut. Allow to cool slightly, then spoon over cookies. Note: The icing will thicken as it sits, so don’t worry if it seems thin. You should take it off the heat when it’s the consistency of runny pudding or when a finger drawn down the back of a coated spoon produces a line. Awesome!! I’m so happy to hear they were a hit at the Oktoberfest party. Sounds like you work with a fun crowd. I made these for an Oktoberfest at work. I brought about 6 of them home and my husband has been begging, on a daily basis, for me to make him some. I had never made them before and the recipe was very simple to follow and not very time consuming. I highly recommend the recipe. Everyone at work also loved them. I had to hurry and grab the 6 I took home because they were going fast!!!!! There is a local bakery that makes something like these. Theirs are amazing. The base on theirs is a little more cake like rather than brownie like, but I’ll try these and go from there. Thanks! I made these 2 days ago and everyone that I made them for just LOVED them!! Super nummy. We ran out of the goo to go on top but I do think that we put on a LOT though. SOOOOOOOO good! Thanks! I’m not a big fan of gooey things either, which is why I tend to chill bar cookies and such….I like them set. These cookies start out gooey, but they do set up nicely. Lea, if I can turn out some decent macros, I’ll try it. I really don’t know much about photography, but I think my little Canon Elph could do macros if I got the settings and the light right. I don’t put a lot of time into the photography. Mostly, I just try to take a good enough shot of the cookie so that people can get an idea of its texture and color. Hi! Your stuff looks amazing. Have you ever thought of posting the macros? Just a thought, for those who are interested. Brenda, let me know how yours turn out of if there’s some way we could improve them. Sandra and Tanya, the cake part tastes like brownie, but the frosting makes the cookies like German Chocolate Cake. Claire, these cookies can travel, but you might want to chill them a little bit before packing so the glaze will be a little firmer. I don’t think I’d stack them. Oooo…these do look good! I’ll have to try these next time I’m supposed to take a treat somewhere! I LOVE German Chocolate cake and never tried making a cookie along that theme – they look great. Thanks for the recipe! Yummm! My husband will love these! I’m going to print it out right now and make them for him this weekend. Thanks!